Capture 24.3MP photos and Full HD video deep beneath the surface with this Nimar PRO Underwater Camera Housing and Nikon D750 Camera Body Kit from B&H. The housing is depth-rated to 328', provides mechanical control of key camera functions, and is equipped with grips on both sides for comfortable operation and attaching lights or strobes. The full-frame D750 features native ISO 12800, extendable to ISO 51200, along with 6.5-fps shooting, 51-point autofocus, a tilting touchscreen and much more. Add a lens, the appropriate port, and a strobe or video light, and you're ready to make beautiful underwater images and video. With your Nikon D750 DSLR camera in this Nimar Underwater Housing, you can capture beautiful images of coral, blue hippo tang fish, and whale sharks at depths as great as 328'. The enclosure features a moisture alarm that alerts you in the unlikely event of a breach in the waterproof seal. The M14 port allows for the addition of an optional bulkhead connector to enable the hard-wiring of a strobe using a sync cord. 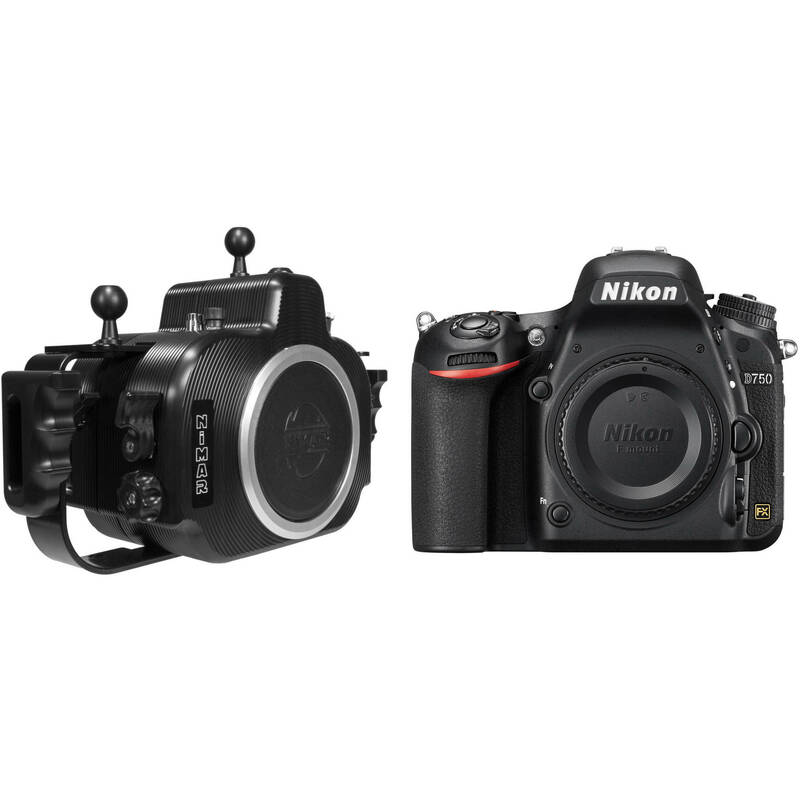 Mechanical controls afford access to virtually all camera functions, while dual ergonomic grips improve handling and provide attachment points for optional lighting arms. The housing ships without a required lens port, and accepts interchangeable ports for many different lenses. For compatibility, please see the port chart. Built with durability in mind, the housing is crafted from corrosion-resistant polycarbonate, which is clear in the back to allow you to monitor the camera and O-ring seal. Snap-locking latches ensure that the enclosure stays shut during your dive. The EXPEED 4 processing power extends beyond still imaging performance to benefit Full HD 1080p video recording in multiple frame rates up to 60 fps. During recording, fully manual control is possible over shutter speed, aperture, and ISO settings, along with the ability to utilize Auto ISO adjustment in manual mode. Zebra stripe highlighting can be applied to aid in controlling overexposure during recording, too, along with in-camera Picture Control profiles, custom tone curves, and a flat profile to benefit color grading applications. Additionally, multi-area mode allows you to narrow your effective field of view during recording, in FX and DX settings, to offer greater perspective versatility during shooting. Supporting the exceptional imaging capabilities of the D750 is an apt autofocus system that employs up to 51 distinct points, with options available to use 9, 21, or all 51 points depending on the situation, with AF detection sensitivity down to -3 EV. 15 cross-type points are also integrated within this array to provide even greater accuracy to centrally-located subjects. Benefitting the use of telephoto lenses and teleconverters, 11 of the focus points are also sensitive down to an aperture value of f/8. 3D Tracking, a part of the intelligent Scene Recognition System, also works to benefit maintained focusing on moving subjects for greater accuracy when shooting at high continuous shooting speeds. The intelligent Scene Recognition System with 3D Color Matrix Metering III utilizes a 91,000-pixel RGB sensor to evaluate and analyze all aspects within a scene, including brightness, contrast, subject distance, and the scene colors, to quickly determine an accurate exposure and white balance setting to best render the scene at hand. The information gathered is also checked against onboard reference images to ensure consistency from image to image in regard to exposure, white balance, i-TTL flash settings, and subject-tracking AF performance. Additionally, benefitting working in difficult lighting conditions, a highlight-weighted metering setting can be used to maintain faithful highlight reproduction. A large 3.2" 1,229k-dot LCD monitor is incorporated into the D750's design, and features a tilting design to benefit working from high and low angles. Additionally, the screen features an RGBW color array to enhance visibility in bright conditions, and can be custom color balanced to match additional external monitors. A bright pentaprism optical viewfinder offers 100% frame coverage and incorporates an organic EL display system to clearly display shooting information for seamless adjustment over camera settings without removing your eye from the viewfinder. A unique monocoque body design helps to lessen the overall weight and size of the camera for more comfortable use during long shooting sessions. The front of the camera and front cover are constructed from carbon-fiber reinforced thermoplastics, and the rear and top covers are magnesium alloy to present a well-balanced mixture of both durability and sleekness. The included EN-EL15 rechargeable lithium-ion battery pack provides up to approximately 1230 shots or up to 55 minutes of recording per charge (based on CIPA standards). A range of scene modes can be employed to base exposure settings on pre-defined, detected scene types: Portrait, Landscape, Child, Sports, Close Up, Night Portrait, Night Landscape, Party/Indoor, Beach/Snow, Sunset, Dusk/Dawn, Pet Portrait, Candlelight, Blossom, Autumn Colors, and Food. Playback functions: Auto Image Rotation, Full-Frame and Thumbnail (4, 9, or 72 images or calendar), Highlights, Histogram Display, Image Comment , Movie Playback, Movie Slideshow, Playback with Zoom, and Slideshow. Box Dimensions (LxWxH) 8.6 x 7.0 x 5.7"